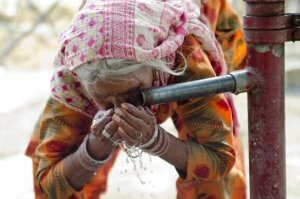 With around 70% of India’s 1.2 billion people living in rural areas and still suffering the burden of sub-optimal water provision as well the indignity of poor/no sanitation, the job of providing water, sanitation and hygiene for the household invariably falls on women. The UN Commission on Sustainable Development has very aptly affirmed that ‘water has a woman’s face’. It is through these women’s hands that households, communities and entire health and economies are sustained. However, this heavy burden often impedes women’s education, income earning opportunities, and social, cultural, and political involvement. As the providers of domestic water supply and sanitation in many villages, women should be actively involved in decision making and management of these resources. Community participation is essential for development; conversely, exclusion of affected groups impedes development. Bias based on caste, ethnicity, age, political or religious affiliations, disability and poverty are among the key causes of exclusion in India. Gender discrimination doubles the exclusion faced by women. Women’s exclusion from decision making and inequitable access to Water, Sanitation and Hygiene (WASH) services and opportunities are of major concern for development practitioners. Practitioners need a common, coherent and pragmatic understanding of gender within the WASH sector. Gender Issues unpacks the key elements of the WASH-Gender nexus, examines these in the Indian context and, drawing from field lessons, recommend ways ahead for improving gender outcomes alongside WASH impact in India. The book evolved from a National Conference on Gender and WASH that was organized jointly by a rural development NGO, S M Sehgal Foundation, and UNICEF India, to share best practices from organizations working at the grass-roots level. Conference participants - educators, government officials, and development practitioners - identified selected WASH initiatives that have proven effective in promoting sustainable water access and have advanced women’s role in water management, sanitation and hygiene in rural Indian villages. Conferees distilled action recommendations covering policy, programming process and design, monitoring, and impact evaluation. This book combines some of the key conference papers that present fresh and practical perspectives for effective WASH delivery with a gendered approach, and introductory and concluding chapters that frame and synthesize the work. The book is necessary and timely for two reasons. First, apart from a few recent case studies focussing on different parts of India, there is lack of comprehensive all-India documentation of WASH issues and so the book contributes to filling existing gaps in knowledge through grass-roots case studies from different regions of India. Secondly, the existing literature covering gender and water issues in WASH has often focussed on larger water resource and supply issues and does not reflect sufficiently on drinking water and sanitation at local and household level. This book adds the important issue of gender and hygiene also. Gender Issues is divided into three sections. Section one provides a conceptual overview of gender in the water and sanitation sector in India. The second section provides case studies involving women in the water sector and discusses women’s participation, roles and voices. The final section focuses on the cases of women’s participation in the sanitation sector with the focus on innovative ways in which women’s role and participation can be up-scaled. A key learning has been that a robust participatory process is vital. Communities need timelines and tools to help ensure gendered outcomes in WASH programs. The sector needs to develop approaches for planning women-inclusive programs, gender disaggregated data collection, and field testing. Successful approaches should be eventually embedded in Government programs for scale and sustainability. Hence, a key aim of the book has been to detail the drivers of success that have resulted in benefits for women and vulnerable groups. India’s WASH sector will require substantial capacity building to effectively engage women’s participation. Authors assert that to advance women’s participation, practitioners must use a rights-based approach and understand local power dynamics. To this end, the book includes studies that show how convergence of efforts of all actors contributes to achieving gender equity in WASH. The book presents many inspiring stories and argues that gendered outcomes and associated impact are possible, even in the most impoverished and difficult environments, but such successes need strong monitoring and follow-up to ensure sustainability. The final Chapter explores what is needed as India moves forward and addresses not only the gender aspect of WASH but the wider gender norms at play in Indian society. This forward-looking discussion is not only relevant to India but to other countries struggling to ensure more equitable access to social services. Edited by Aidan A. Cronin, Pradeep K. Mehta, Anjal Prakash. SAGE Publications, New Delhi, released January 2015. Aidan Cronin is Chief of UNICEF WASH program, UNICEF Indonesia (formerly UNICEF India); Pradeep K. Mehta is Group Leader at the Rural Research Center at S M Sehgal Foundation in Gurgaon, India; and Anjal Prakash works at the International Centre for Integrated Mountain Development in Kathmandu, Nepal.